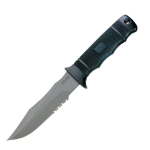 The SOG Force tactical knife is renowned for its strength and durability. The thick blade and narrow grind profile provides ultimate strength. Because it is composed of AUS-8 steel, the knife has been reported to be virtually unbreakable. 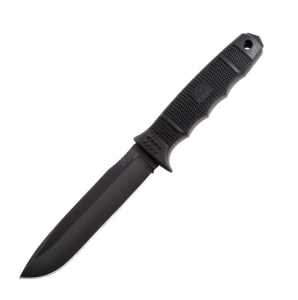 This 6-inch straight-edge weapon has a full tang that extends all the way through the glass-reinforced handle into a powerful glass-breaking point. The handle has a sleek contour and rugged checkering to ensure a secure grip. 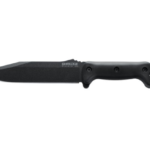 The clip point of the fixed-blade SOG Force knife allows for quick and deep punctures. This knife is recommended for intense, long-duration operations. The acronym SOG stands for Studies and Observation Group, an elite joint services military group created during the Vietnam War to handle covert operations. Several years after the group was created, SOG Specialty Knives was founded, with the spirit of the military SOG group living on in the company. 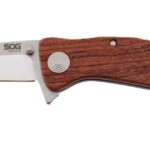 SOG Specialty Knives became the first knife manufacturer to offer an extended line of weapons, including fixed blade knives, folding blade knives and multipurpose tools. These tools, well-known for their sleek style and stunning performance, embody dependability, innovation and power. SOG’s tactical products have become the product of choice for military, law enforcement and commercial customers who are looking for tools that give flawless performance in the harshest, most unpleasant situations. SOG treated the Force Knife with the company’s unique cryogenic heat treatment process; a process that results in a tougher and more wear-resistant blade than many contemporary weapons. 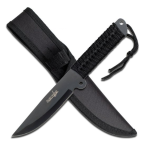 The black nylon sheath typically included with this weapon comes with a lanyard hole, a nylon lanyard, a hook-and-loop closure system and a MOLLE attachment to keep the weapon protected. There are many different uses for tactical knives such as the SOG Force Knife. 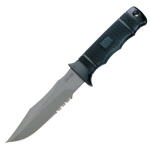 For example, those who enjoy outdoor activities usually prefer to have a tactical knife with their gear rather than a standard knife, which is quite often neither as sharp nor as durable as a tactical knife. Some people like to have a rugged, durable knife in a “bug-out” bag in case of a national emergency, while others like to have the weapon on hand in case they need it for self defense. Knowing how to properly use the SOG Force knife is a key part of the ownership process. After all, if the owner is attacked suddenly and hasn’t the faintest idea about how to use the weapon, he or she would probably be better off not owning it. Basic knife fighting strategies, drawn from sources such as the Marine Corps Martial Arts Program, have been listed below. The knife fighter’s stance is very important. If the stance is not adequately defensive, the defender can be killed in the first five seconds. The best stance is commonly referred to as the triangle stance. The defender stands with his armed hand in a slightly relaxed position by his side and his unarmed hand in front of his chest, protecting the abdomen and the solar plexus and ready to protect the throat and head if necessary. The defender should be prepared to sacrifice this hand in order to protect his vital organs. If the defender stands with his free hand up and forward, his vital organs are vulnerable. The grip on the weapon is nearly as important as the stance. A bad grip can cause loss of the weapon and serious ramifications will follow. The hammer grip—holding the weapon naturally after it is drawn out of the sheath—is the grip recommended by the United States Marine Corps. The reverse grip typically gives less power to the defendant. Defendants should always keep the weapon between themselves and the opponent. This enables the defendant to quickly block blows and slashes delivered by the opponent. Also, the defendant should attack the opponent’s weapon hand with the goal of disarming him. Targeting correctly is essential to cause speedy dropping of the opponent. Aim for the carotid arteries in the neck, the lower abdomen, the groin region and the aorta for maximum effect. Extremities—the arms and legs—are secondary targets. Attacks at the right points on the extremities, such as the femoral artery in the thigh and the brachial artery between the biceps and triceps of the upper arm, will cause severe bleeding. All in all the SOG Force is a great fixed blade, tactical knife that you should definitely check out!